Strange is the Punjab Government’s way of functioning. While the fund-starved government has no money for its employees, there is no dearth of funds for the high and mighty. The common man continues to pay high power bills with the Punjab State Power Corporation Limited (PSPCL) making a case for a tariff hike year after year allegedly by concealing profits. Deputy Chief Minister Sukhbir Badal has tried to broker a truce between Shiromani Akali Dal (SAD) stalwart Ranjit Singh Brahmpura and Chief Parliamentary Secretary Harmeet Singh Sandhu, Tarn Taran MLA. Dubbing the saffron party as “anti-Sikh”, Punjab Congress spokesman Sukhpal Khaira today alleged that veteran BJP leader LK Advani pressurised then Prime Minister Indira Gandhi for the Operation Bluestar in 1994. To substantiate his claim, Khaira showed a picture wherein Advani was shown leading “Rosh (protest) march” conducted in May 1984, thus “compelling Indira to send the Army to Punjab”. The Punjab Police is preparing a bulletproof stage for BJP’s prime ministerial designate Narendra Modi’s ‘Fateh rally’ in Jagraon on February 23. An official said the stage would be at a “safe” distance so as to avert any shoe-throwing incident, as had been reported during Haryana Chief Minister Bhupinder Singh Hooda’s rallies recently. Putting all speculations to rest, BJP MP Navjot Singh Sidhu today made it clear that he was neither joining the Aam Aadmi Party (AAP) nor would he play a spoiler in case the BJP denied him the ticket from the Amritsar Lok Sabha constituency. He has already stated that he would contest only from Amritsar and nowhere else. Students of Punjabi University today locked the main gate of the campus for more than an hour following allegations of manhandling by a hostel warden. The state government failed to disburse compensation cheques to families of farmers, who had committed suicide, at the district administrative complex here today. Sleep disorders have led to a 30 per cent rise in number of diabetic patients. Sleeping for less than five hours and more than 10 hours is harmful and may lead to complexities. This was stated by Dr Shashank R Joshi, president, Association of Physicians of India (API), at its 69th annual conference here today. 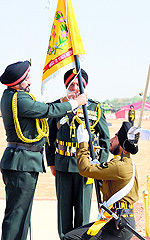 General Bikram Singh, Chief of Army Staff, on behalf of President Pranab Mukherjee, presented the 'Standard' to 67 Armoured Regiment at Bikaner Military Station on Friday. A formation of tanks mounting the President's 'Standard' was paraded amidst an exuberant audience. The weekly Hoshiarpur Express from Hoshiarpur to Delhi will soon run daily as the Railway Ministry has accepted Hoshiarpur MP Santosh Chaudhary’s proposal in this regard. The new schedule will be announced in the Railway Budget after the General Election. The BJP again found itself in a tight spot as someone today defaced the photograph of Prime Minister Manmohan Singh’s wife Gursharan Kaur on a BJP hoarding outside Nehru Park. A separate symposium was dedicated to geriatrics (the branch of medicine dealing with the health and care of old people) at APICON. The State Human Rights Commission has taken suo-motu cognisance of the attack on Indian student Manrajwinder Singh in Melbourne, Australia. A human rights body, Centre for Human Rights Training and Research Association, had complained to the panel. In yet another twist to the controversy over Nurmahal dera chief Ashutosh Maharaj's death, a disciple today moved the Punjab and Haryana High Court, alleging that dera managers had kept the Maharaj's body in a freezer. The trial in the abduction and wrongful confinement case against Punjab Director-General of Police Sumedh Singh Saini in Delhi is back on the track with the “unconditional” withdrawal and subsequent dismissal of a transfer application filed by the top cop. The UT police have arrested Yograj Sharma, former deputy secretary, Punjab Civil Secretariat, in connection with the mysterious disappearance of 27 confidential files related to several IAS and PCS officers of Punjab cadre. A total of 35 files had gone missing from the Civil Secretariat. Seven files were recovered in March, 2011. The government intends to buy 131 luxury cars and SUVs for the Chief Minister, his deputy, Cabinet Ministers and Chief Parliamentary Secretaries. 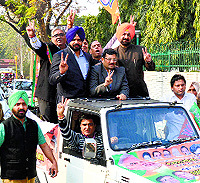 Mahesh Inder Singh Grewal and Tikshan Sud, advisers to the government, have also demanded new cars. The Transport Department has, in a communiqué to the Finance Department today, stated that the cars being used by these leaders were “too old” and needed to be replaced, it is learnt. As an austerity measure, the government had banned the purchase of new cars in 2012-13 and then again in 2013-14. New vehicles could be purchased only in special cases after the approval of the Finance Minister. The budget for the current fiscal had a plan outlay of Rs 250 crore for the Transport Department, which was to be used mainly on the maintenance of old cars. While the Transport Department has failed to provided details about the utilisation of the Rs 250 crore budgetary allowance, it has now sought an additional Rs 13.50 crore to buy the 131 cars, including Toyota Fortuner, Camry and Corolla models. But, the final call on buying these cars would be taken by the Finance Minister. Even as the government wants to please political functionaries by getting them new vehicles, it today discontinued free travel in PRTC and Punjab Roadways buses for the police personnel. The policemen, from the rank of Constable to Inspector, used to be issued free travel slips by the department. The letter discontinuing the facility (The Tribune has a copy) mentions that “police tickets” would cease to work from February 28. The public bus service providers used to submit these tickets to the police department for reimbursement. But, no refund has been made for the past several years. The police department owes Rs 50 crore to the PRTC alone. A senior official in the Punjab Police welfare wing said the old ticket system would be replaced with a new hi-tech method. In sharp contrast, the corporation has allegedly extended huge favours to two companies, which delayed commissioning of thermal power plants in Talwandi Sabo and Goindwal, by failing to recover around Rs 763 crore liquidated damages. Though the PSPCL management claims that notices have been sent to the companies, the delay in recovering the damages has raised many an eyebrow, putting the role of PSPCL top brass under the scanner. The companies are liable to pay the damages on failing to commission the power plants on time. The delay forced the state to buy power from other sources on higher rates. As per the agreement, the company, which fails to meet the deadline, is liable to pay Rs 10,000 per month/mega watt (MW) as damages to the PSPCL. However, if the delay exceeds 60 days, the company is required to pay Rs 15,000 per month per MW. Sources in the PSPCL alleged that the corporation had "fudged" data for power supplied to the farm sector which was exposed by the Punjab State Electricity Regulatory Commission. The corporation had claimed that its transmission losses had come down from 20.12 per cent in 2009-10 to 17.6 per cent in 2011-12. The reality was that it had “inflated” figures of power supplied to the agricultural sector, they said. To seek a 13 per cent hike in power tariff, the PSPCL had “shown losses” in its petition to the PSERC. "Instead of taking steps to bring down the power tariff, the PSPCL top brass kept the file to recover liquidated damages pending with it for over two months," alleged Baldev Singh Sran, president, PSEB Engineers Union. "The amount has not been recovered despite the fact that none of the five thermal units could be commissioned till date. If recovered, this amount would help improve PSPCL's financial condition and the benefit could be passed on to the consumers", said Bhupinder Singh, senior vice-president, PSEB Engineers Association. KD Chaudhri, CMD, PSPCL, said there was "no attempt to spare defaulting companies". The amount would be collected from them from the date of commercial operation. "All those raising questions on the matter should keep patience. We will recover the damages and pass the benefit to the consumers," he added. There is no attempt to shield defaulting companies. The amount will be collected from them. The benefit will be passed on to the consumers. Brahmpura is SAD candidate for the Khadoor Sahib Lok Sabha constituency. During his visit to Tarn Taran yesterday, Sukhbir arranged a meeting between the two leaders at Sandhu's residence . The Brahmpura—Sandhu tussle is an open secret. Their supporters have come to blows in the past. There has been long-standing rivalry between Sandhu and SAD leader Alwinderpal Singh Pakhoke, who is Brahmpura’s nephew. Sandhu had allegedly fielded parallel candidates against the party’s official candidates in the Zila Parishad elections in May last year. Brahmpura had criticised him on the issue, saying those opposing the SAD candidates were backstabbing the party. He had refrained from taking any names. Pakhoke had accused Sandhu of openly campaigning against the official party candidates in the district. Now that Brahmpura has been fielded from Khadoor Sahib, the Deputy Chief Minister does not want party infighting to come in the way of the SAD candidate’s victory. Hence he has initiated the unity move. Dubbing the saffron party as “anti-Sikh”, Punjab Congress spokesman Sukhpal Khaira today alleged that veteran BJP leader LK Advani pressurised then Prime Minister Indira Gandhi for the Operation Bluestar in 1994. 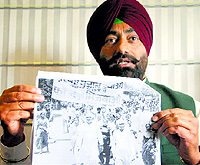 To substantiate his claim, Khaira showed a picture wherein Advani was shown leading “Rosh (protest) march” conducted in May 1984, thus “compelling Indira to send the Army to Punjab”. He also quoted text from Advani’s book ‘My Country My Life”, which reportedly endorses it. “The Operation Bluestar cannot be justified but the SAD-BJP alliance’s attempt to gain political mileage out of it is unacceptable. They have been misguiding the state people,” he said. While hitting out at BJP’s prime ministerial candidate Narendra Modi, Khaira called upon the Sikh community to boycott the Gujarat Chief Minister’s ‘Fateh Rally’ in Jagraon on February 23. He alleged that Modi had tried to displace more than 50,000 Sikh farmers from Kutch. “Which ‘fateh’ (victory) the SAD wants to boast of by inviting Modi to Punjab? The Gujarat CM had filed a special leave petition in the Supreme Court to deny any relief to the Sikhs despite the fact that the aggrieved families had won the case in the Ahmedabad High Court,” he said. The Punjab Police is preparing a bulletproof stage for BJP’s prime ministerial designate Narendra Modi’s ‘Fateh rally’ in Jagraon on February 23. An official said the stage would be at a “safe” distance so as to avert any shoe-throwing incident, as had been reported during Haryana Chief Minister Bhupinder Singh Hooda’s rallies recently. Sources said the bulletproof stage had been set up in the wake of a bomb blast at a recent rally addressed by Modi in Bihar. Also, the SAD-BJP alliance has issued instructions to its leaders of the parliamentary constituencies of Bathinda, Faridkot, Ferozepur, Ludhiana and Sangrur to put up a show of strength. The organisers, led by Deputy Chief Minister Sukhbir Badal and BJP state president Kamal Sharma, are aiming to gather over 3 lakh persons. The media team that travels along with Modi and provides live footage of his rallies to TV channels and websites would also be keeping a watch on the movement of any suspicious person. The team installs over 10 cameras and is linked to a satellite. Jalandhar: Local industrialists plan to show black flags to Narendra Modi at his Jagraon rally to protest the Punjab Government’s alleged indifferent attitude towards their demands. Hitting out at the Badals, Sidhu said, “It is not about the SAD but about two persons — CM Parkash Singh Badal and his Deputy CM-son Sukhbir Badal. They are the Akali Dal. Nothing happens in the party without their approval.” He said Badal was a father figure to him, though it was different matter that he treated him like his “step son”. He also rubbished rumours about his joining the AAP. He said Kamna Vohra had got about Rs 5 lakh for handling 20 cases, Gurbax Singh Rs 1 lakh for four cases and Jagjit Singh Rs 1 lakh for five cases. Jasmeet Singh, handling 5 cases, had not been paid any fee. He said all of them were established lawyers. “The Sikh community is indebted to them for risking their life and careers by taking up these cases. Instead of being grateful to them, Makkar, at the instance of Sukhbir Badal, is trying to malign the lawyers. Sukhbir is creating an atmosphere wherein no lawyer will come forward to fight cases against the likes of Sajjan Kumar and Tytler,” Phoolka said. The AISSF today claimed that ever since the CBI had filed a closure report in favour of Congress’ Jagdish Tytler in 2007, the case was being handled by a panel of lawyers retained by the US-based 'Sikhs for Justice'. New Delhi: The Delhi unit of the SAD today asked HS Phoolka on what moral ground he was contesting as the candidate of a party that had formed government in Delhi with the Congress support. “The move has shocked the Sikhs,” said DSGMC chief Manjit Singh. Manjinder Singh Sirsa , DSGMC general secretary, said huge payments had been made to advocates recommended by Phoolka. “It needs to be checked why none of the cases contested by the panel have reached a conclusive end,” he said. The students alleged Amanpreet Singh, warden of Banda Singh Bahadur hostel, University College of Engineering, conducted a surprise check in the hostel on Wednesday night in an inebriated state and misbehaved with the students. Jagdeep Singh, a student, alleged the warden entered their room and started abusing them. He even took off the turban of a student, he alleged. "We had lodged a protest with the university authorities soon after the incident, but no action has been initiated," he added. Another student Jagjot Singh claimed the warden was a habitual offender. Kulbir Singh Dhillon, Dean, Student Welfare, said a six-member committee had started investigating the matter. There were complaints that some students were consuming liquor when the warden raided the hostel, he said. "We will record the statements of students, warden and others present at the time of the incident. We will also examine the CCTV footage," he added. A large number of people from across the district converged here, but they were denied entry to the complex, which forced them to lodge a protest. A meeting was later held between the families and Deputy Commissioner Paramjit Singh, who assured that the cheques would be disbursed in two days. In a survey conducted by Dr Shashank, he found that sleep disorders were found more in working people since they tend to change sleeping hours according to their convenience. "Besides adequate sleep, sleeping at the right time is also important. Those who go to bed very late, tend to put on weight. Sleep at the right time in right proportion to stay away from diseases," he said in his message for the masses. Expressing serious concern over people hooking to the internet for solving their health problems, he said the trend was dangerous and could lead to serious complications. He cautioned people not to search the internet for solving health issues but rather see a doctor. "'Google doctor' is a threat in the present times. Less knowledge is sometimes very dangerous", he said. Talking on dietary habits, he said: "Avoid eating fried foods, junk food and dry fruits, except for almonds and walnuts which should also be taken in moderation. Cut down intake of common salt and increase the intake of water and see your health prospering. Relax, exercise and have a hearty laugh every day," said Dr Shashank. Dr Sandeep P. Tamane, a geriatrician from Pune, said: "Geriatric units at hospitals are the need of the hour. These centres help the elderly in their day to day health-related issues”. They are not required to visit hospitals for getting their routine check-ups done. Instead a team from the geriatric unit visits them, he said. He said the unit also took care of the diet of the elderly which was planned as per their health condition. Family members were also given training to handle an emergency situation, he added. Lt Gen AK Sahni, GOC-in-C, South Western Command, Lt Gen NS Ghei, GOC, Chetak Corps and a number of senior military and civil dignitaries also attended the event. Lt Gen AS Chabbewal, Master General of Ordnance and Colonel of 67 Armoured Regiment, hosted the event. This honour was bestowed upon 67 Armoured Regiment in due recognition of its dedicated and meritorious service since its raising on 15 September 1967. The 67 Armoured Regiment has participated in a large number of operations undertaken by the Army. Her picture was first spotted yesterday on the hoarding that also featured senior BJP leaders. Sources said BJP workers defaced Gursharan Kaur’s picture. Dr Sandeep P. Tamane, a geriatrician from Pune, said: "Geriatric units at hospitals are the need of the hour. These centres help the elderly in their day to day health-related issues. They are not required to visit hospitals for getting their routine check-ups done. Instead a team from the geriatric unit visits them," he said. This was done to gain time for appropriating dera properties, he said. He urged the High Court to direct the state of Punjab to immediately takeover the assets belonging to the Divya Jyoti Jagriti Sansthan. Mohinder Pal Singh and his co-petitioner Dinesh Chander said they apprehended misappropriation of property worth Rs 1,000 crore by the dera managers. Their counsel CM Munjal said the petitioners' prime concern was Rs 300 crore lying in the dera. He pleaded that directions be issued to get the dera "released from unauthorised persons" and a retired High Court Judge be appointed administrator to look after the dera property before it was given away to charity institutions as per the Maharaj’s wishes. The PIL is likely to be taken up for hearing on Monday. A fortnight ago, the High Court had dismissed a habeas corpus petition for "Maharaj's release." In his order, Justice MMS Bedi had said: "From the doctors' report, it is clear that the alleged detainee at the time of presentation of the petition was clinically dead. Available information suggests Saini on a previous date of hearing had undertaken to unconditionally withdraw the transfer petition filed before the District and Sessions Judge at Delhi by February 21. The plea was today dismissed as withdrawn. The development is significant as Saini had practically challenged the impartiality of the court. Saini is accused of being involved in abduction and elimination of three persons in 1994. After a detailed investigation, the CBI filed a charge sheet. The charges have already been framed. Saini is out on bail. Delhi Business man Ashish Kumar had earlier created a flutter in the Punjab and Haryana High Court, claiming Punjab Vigilance chief Sumedh Singh Saini was out to eliminate him. He has all along been saying his brother Vinod Kumar, brother-in-law Ashok Kumar and their driver Mukhtiar Singh were kidnapped and eliminated and the CBI had found Saini and three other police officials responsible for their disappearance. The police said the missing files related to serious complaints and inquiries against IAS and PCS officers, against whom departmental probes were marked. The files were forwarded to Sharma, the then under secretary in the Personnel Department. The police had registered an FIR against Sharma in March last year. Sharma had been indicted by a departmental probe. During questioning, Sharma could not give any reply to the police as to how the files went missing. He was produced in a local court that remanded him to judicial custody.